The North Island Chapter takes great pride in awarding the Bronze Medal to Gwen Wright. 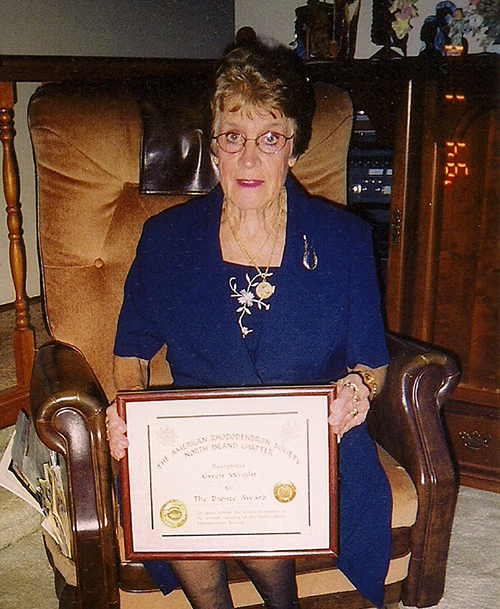 Gwen, as a long-time member, has devoted countless hours in undertaking the many activities that help ensure the smooth running of the chapter. Whenever there is a call for help, Gwen responds enthusiastically. She has assisted in the organizing and running of the annual shows and sales in Courtenay and Campbell River, gets involved in work parties for our rhododendron display garden, helps with phoning committees, and has hosted a number of chapter functions at her home and garden. At our monthly meetings, Gwen always arrives early to help set up and is amongst the last to leave. Gwen, your quiet dedicated service to our chapter is greatly appreciated and an inspiration to all. Thank you.